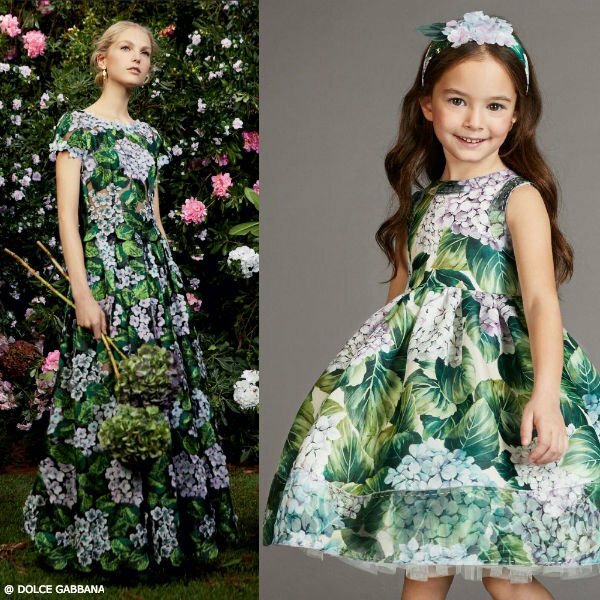 Love this stunning DOLCE & GABBANA Girls Mini Me Ortensia Hydrangea Silk Dress. Your little one will look like a princess wearing a beautiful silk organza dress that's perfect for any special event including an English garden party or wedding. A standout piece in the Dolce & Gabbana 'Ortensia' mini-me collection, this original fabric has a wonderful hydrangea print in full bloom. A fitted bodice gives way to a full and flared skirt, that is lined in viscose satin, plus a removable tulle petticoat. Complete the Ortensia looks with an illustrated hydrangea printed canvas bag from Dolce & Gabbana with a mini me design that evokes the scent of fresh flowers. Seen here with a matching Ortensia floral hairpiece. Will look perfect with a pair of matching ballet flats.